Up-and-coming Chinese carmaker GWM has expanded its local line-up with an all-new SUV model, the H6. Up-and-coming Chinese carmaker GWM has expanded its local line-up with an all-new SUV model, the H6, which follows hot on the heels of GWM’s impressive C20R hatch, which was launched here in September. With the H6, GWM is taking aim at SUVs such as the Hyundai iX35, Kia Sportage and Nissan X-Trail. The H6 measures 4 640 mm in length and has a 2 680-mm wheelbase, while it rides on 17-inch alloy wheels and has 180 mm of ground clearance. There are two engine options available ? a two-litre turbodiesel and a 1,5-litre turbopetrol (which will only go on sale a bit later). In turbodiesel guise the H6 has a power output of 105 kW and torque is 310 Nm. A six-speed manual transmission transmits power to the front wheels. 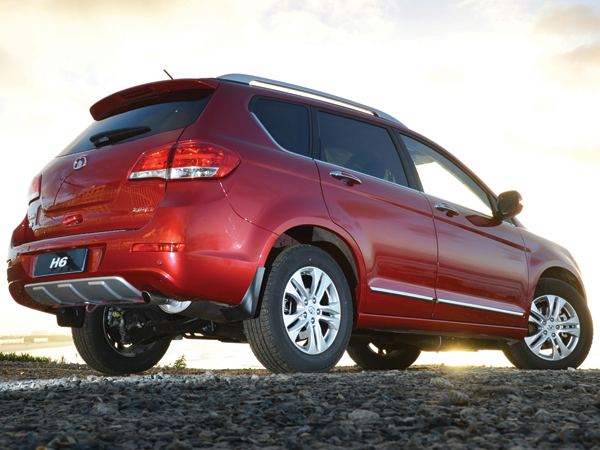 GWM claims an average fuel consumption of 6,7 litres/100 km. The 1,5-litre turbopetrol engine delivers 105 kW too while torque is 210 Nm. This engine is also mated with a six-speed manual transmission and delivers a combined cycle fuel consumption figure of 8,5 litres/100 km. Furthermore there’s a comprehensive list of specifications which includes split/folding rear seats, leather trim, a full-colour touch-screen system featuring radio/CD/DVD/MP3 playback with a mini-SD slot and USB and auxiliary ports, Bluetooth, remote audio controls, rear-mounted camera and parking sensors. Climate control, power steering, cruise control, all-round electric windows, electric mirror adjustment, rain-sensing wipers and automatic headlights with manual levelling are among the other features. With regard to safety the H6 has dual front airbags, disc brakes all round, ABS with EBD (electronic brake force distribution) and BAS (brake assist). The front seatbelts are height-adjustable and feature load limiters and pre-tensioners. At the rear, Isofix child seat mounts provide the safest possible anchorage points for child seats. Tyre pressure monitors are also standard on both models. Both H6 models are backed by GWM’s comprehensive three-year/100 000-km warranty and come with two years’ AA roadside assistance.